British rocker inspired by Broncos quarterback. 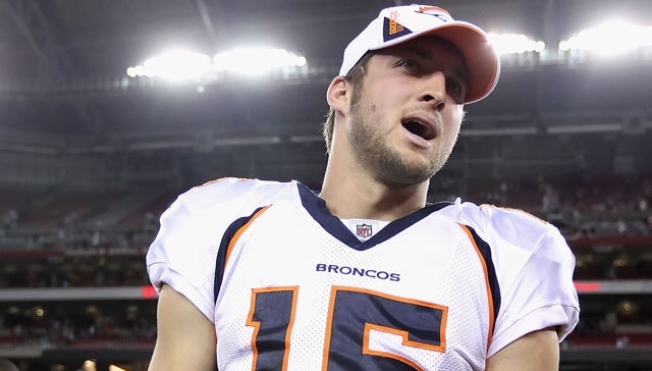 Tim Tebow is the subject of widespread adulation—and a viral rock song. Pop culture nostalgists, take note: a 1985 Billboard chart-topper has gone back to the future, riding the Tebow wave. John Parr, the Grammy-nominated rocker behind "St. Elmo's Fire (Man in Motion)," has revamped his one-hit-wonder as a stirring ode to Denver Broncos QB Tim Tebow. The song, famously used as the theme for Joel Schumacher's eponymous Brat Pack dramedy, has been retitled "Tim Tebow's Fire" and features lyrics like "Gonna be a man in motion, all I need's my Broncos team." Parr told FOX31 in Denver that he was "inspired by Tim Tebow" and sought to "modify the lyrics ... in [Tebow's] honor of the way he lives his life as being a great example." Although the song is primarily associated with Schumacher's Razzie-winning coming-of-age flick, Parr originally wrote the song as a tribute to another athlete: Rick Hansen, a wheelchair-bound Canadian paralympian who traveled the world in the mid-1980s on a "Man in Motion" tour.